And I'm wondering, why, why, why, why? God knows why, why, why? Great track on a great album. This is what makes RP so damn good! its for not well known almost forgetten gems that i love RP especially for. A killer song, sheer perfection, timeless and still fresh..
That bass line ... so simple and yet what a groove! I feel ya! I'm giving a 9 (10s are special) which is pretty much the same as a 10 for me, the only main difference being that a 10-song and I have some sort of history together. That being said, the reason I have limited history with this awesome track is that most "classic rock" stations wont play it at 6:31 in length, although I can probably get it for the 'Drive @ 5' on KZOK today after-work. Wow....wasn't that long ago that I was still listening to the FM station fairly regularly. I'll still, once-in-a-while turn on the HD2 KZOK station for the commercial-less classic rock "deep cuts" where one might hear this. Sooo good. Chair groovin' Another thank you nod to my older brothers....Traffic was and is wonderful...still going strong. Today, this is a perfect 10. That bass line & rhythm is all Motown soul. Creamy delicious. What an under rated band. Boy, I would have loved to catch that tour. Omg, listened to this fantastic album over and over - how easy it was for me to fall in love with Stevie's voice. Thank you, thank you for playing this lovely masterpiece!! This hunter is an exception, he can't afford an ohh ! I take revenge by painting the sky black.. Bet if he kept at it the singer could have a decent career. Sooo thankful for older brothers with good musical taste. This is a gem! 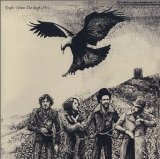 The album's title is actually:" As The Eagle Flies", a great piece of 1974 music. Nice timing, Bill! How did you know the weather here today? Winds sustained at 30, gusts to 50. I thought I had all of the Traffic albums ... but not this one. Never even heard of it, and it sounds great. Close my eyes and flying back in the seventies, where everthing seemed to be easy and possible! Nice mix of keyboards - drags out a little bit, though. These gentlemen conveyed so much within their spare arrangements. Perhaps because of the 'space' in their music, one finds the ability to really appreciate each musician's skill and contribution to the whole. Each of their albums still sounds good today. Stated another way, the bass work in this ancient piece is a fabulous example of early funk/ska/reggae, and isn't it nice that the drums and piano don't overwhelm it? This album is phenomenal and, IMHO, has endured the test of time. Thanks Bill. An old favorite. LOVE hearing it tonight. From Dire Straits to Windwood to Rusted Root. Truly RP, truly classy, thanks, Bill. Great to hear Traffic. How about the other 19 in the library Bill? Good Lord, this was overflowingly great when it came out and still stands as quite a masterpiece, I'd say! Reminds me of times we'd sit around enlightening ourselves with tunes like this and immersing our minds in fully-bent discussion of them — instead of the Calculus and Physics we were supposed to be studying! — and such are diversions that continue to this day to pay far better dividends for the effort! One of my very favorite songs. I remember listening to this on KIKI in Honolulu in the mid 70's when they were a reasonably free form AM station. Another great song they played was Van Morrison Autumn Song. Thanks for playing this, it brings back pleasant memories. Not enough Traffic played. Not enough Steve Winwood played. Not enough Jim Capaldi played. The oldies really don't sound old at all on RP! Traffic? I give it an 8! Nice segue, Bill, from Dire Straits-On Every St.! Old bands always sound great! Great song, Great Band.. Needs to be played way more often..
Bumping this from 7 to 8 - I'm liking it a LOT. Then again, I always love to hear Traffic. I have this track from their 1974 album "When The Eagle Flies"
Nice to hear more Traffic - Its a shame this hasn't been played since 2002 til now! Great conjunction, Bill -- Classic Traffic cover, then into the real thing.